Lemax Gathering Firewood Figurine depicts a young boy and his pet dog outside in Winter collecting up branches for burning on the fire. Relative newcomer to the seasonal Lemax Village miniatures range joining the Vail Village themed range in 2016, suited for placement in a Winter or Christmas Lemax display. 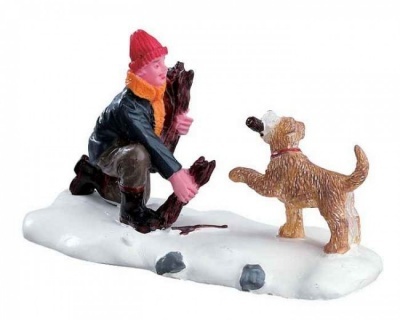 The Gathering Firewood piece comprises of two individual hand painted polyresin figures on a single snowed base to compliment your seasonal Lemax Village Christmas display.